Tank Combat in North Africa, by Thomas Jentz. Having chosen 'Swanning About' as the next Benghazi Handicap scenario to refight, I wanted to do the write up a bit differently. So I'm starting with some photos and explanation that might get you into the mood for the wargame. An overview of Operation Battleaxe and the Hafid Ridge action, which took place in June 1941, can easily be summoned online, or through any decent book on the campaign. Such an overview is not the purpose of this little introduction. Rather, I wanted to briefly explore some aspects of the battle which might illuminate the wargames scenario. If you have already read my earlier post, 'Wargaming 2008', you will know that I do not really believe miniature wargames are capable of 'simulating' warfare in any meaningful way: I believe what we are doing is playing with toy soldiers. But that doesn't prevent us from doing some research into our period, especially when we are considering a refight of an historical battle. Hafid Ridge is often cited as an example of the poor tactics of British armour during this period: a gung-ho charge against a well concealed line of German anti-tank guns. However, Frank Chadwick, author of Benghazi Handicap, makes it clear that this was not the whole story. Military historian Paddy Griffith has described the problems the British had in his book, World War II Desert Tactics. 'On Hafid Ridge the British would encounter a phenomenon that would become almost typical in subsequent battles. This was the allure of an enemy position that appeared to be only lightly defended, or occupied only by vulnerable soft-skinned vehicles. The temptation would be strong for British armour to charge in piecemeal and without careful preparation, leading to disastrous results when the enemy's 'vulnerable' trucks turned out to be accompanied by towed guns, some of which turned out to be very dangerous indeed to attacking tanks. On Hafid Ridge this problem was made worse by the complexities of the terrain, which turned out to consist of three successive ridges rather than just one; the Axis forces lurking behind the second and third caused all sorts of unexpected difficulties to the British armour that had successfully cleared the first. That there were problems with British tactics can hardly be disputed: the reference in the 6th RTR war diary to carrying out 'a good broadside shoot ... at speed' has been much quoted, and is hardly indicative of modern tactics. However, the British of 2nd RTR and 6th RTR did have a confusing and difficult situation to deal with, and were facing a well laid out defence. These factors should be borne in mind. This 88mm is dug in at Halfaya pass, but indicates what one of the 88mm positions on Hafid Ridge may well have looked like. The caption is well worth reading. The photo is taken from Thomas Jentz's invaluable Tank Combat in North Africa. This is a pair of German gunpits, including one which seems to contain a 20mm flak gun as employed at Hafid Ridge. Once again, not actually Hafid Ridge (as far as I know) but indicative of how hard to spot such positions could be, even in open desert terrain. The image is from a New Zealand website, 'The Desert War'. 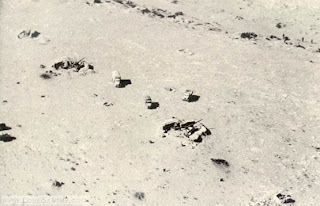 This photo (from lonesentry.com) is captioned as being of a 'dummy Axis gun position near Halfaya Pass'. If so, this shows how convincing such a position could be. The British concluded they had encountered dummy positions during the Hafid Ridge action, as the map below (once again from Jentz's book) shows. It is interesting to note how hard it is to work out the lie of the land from this map. Working out where the various ridges and dips were must have been a real problem for the British. Jentz's book presents most of the primary evidence from both sides regarding Hafid Ridge. The extent to which there were dummy positions, or the extent to which the German defence was in any way 'mobile', is not really clear. It would seem survivors of the first line of positions may have fallen back behind the second ridge to join their comrades, which tempted the British on. The position was certainly arranged in depth, with many, possibly most, of the guns in dead ground between the ridges rather than actually on the ridges. 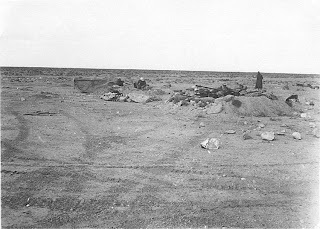 It is worth noting that both British tank regiments believed they were shelled by artillery at various times, and that the Hafid position contained a number of field guns. However, the order of battle for Stutzpunkt 208 did not include any artillery, just 20mm, 37mm, 50mm and 88mm AT guns. Probably fire from the 88s and the 75mm guns of German Panzer IVs was mistaken for artillery. Benghazi Handicap gives the Germans no on- or off-table artillery for this scenario. German reports indicate the British may have suffered some artillery fire from guns supporting Stutzpunkt 206 during their approach to contact. I hope this introduction has given you a bit more feel for the circumstances of the battle, whether or not you possess Benghazi Handicap. Without further ado, this was my adaption of the scenario for BKC, using a 4' x 4' table with 6mm size models. All German command units have a 25cm command distance increment. British initial troops deploy first up to 15cm from baseline. Then German initial forces deploy anywhere up to the centre of the table. All may be dug-in. They may also use hidden deployment, and are allowed 3 fighting units plus one command unit as dummies. British reinforcements deploy up to 15cm from baseline during the command phase of move 3. German reinforcements deploy up to 15cm from baseline during the command phase of move 5. Any German reinforcing battlegroup may also use flank deployment on either flank, in the first two thirds of the table. Both sides seek to break the opposing force, in order to control the area. Minor objective is to inflict 25% casualties, the major objective is to break the opposing battlegroup. No turn limit. This battle was a natural for the optional 'Hidden Deployment' rules from the first edition of BKC. However, with such a small initial force, and considering the circumstances of the battle, I decided to allow dummy units for 50% of the force, plus a command unit as well. This should keep the British guessing for a couple of moves. Making 2nd RTR deploy first, before the German defence is positioned, is another attempt to give the defenders an edge. The 25cm command distance for the Germans was a small experiment to help them with both initial deployment and the mobile battle to follow. Perhaps this would help to represent their greater tactical flexibilty. Both sides have the option of a separate brigade level CO operating solo and therefore able to intervene around the battlefield, rather than having the CO allocated to a fighting formation as in my Mechilli refight. I also decided to go for simple victory conditions without objectives, as if this was a BKC 'encounter' battle. I wasn't entirely happy with the look of the terrain. I had ordered 2 custom ridges from TSS but had asked for them to be too squared off at the ends. Silly me. The colour of flock used by the company has also subtly changed since I acquired my tiles, although the photo accentuates the colour difference. These two problems together resulted in the rather unconvincing rectangles you see above. German baseline on the left (this direction is north), British on the right (south). The wadis in this game are 'shallow' in CDTOB terms, so they only count as dense terrain for BKC. The edge of a wadi will break LOS to units within the wadi. This is the end of move 1. The A13 squadron of 2nd RTR have positioned themselves on the crest of the first ridge, and two tanks have been knocked out. This has meant that the real 20mm flak and 88mm gun have been revealed (if they were dummies they wouldn't have been able to fire), and the dummies removed. Move 3, and 6th RTR and Jaxo column have arrived, deployed on the British right flank. 2nd RTR see no advantage in taking on the German gun line and so fall back and manoeuvre around the east end of the ridge as well. In this movement they were covered by smoke fired in move 2. Next move finds the British huddling uncertainly in dead ground. Where will the German reserves arrive? Half the German tanks with an HQ, plus the anti-tank guns and infantry under the CO, arrive on the German baseline to oppose the British tanks. A Crusader is knocked out. The other half of the German tanks were unfortunately ordered to arrive on the German right flank, well away from the action. Even more unfortunately, they will fail to arrive until move 8. Move 6, and the high point of German success. The British fall back from the fire of German tanks and supporting anti-tank guns. 2nd RTR, however, start to sneak up on the Germans behind a rise on the east flank. Moves 7 and 8 and the British start to use their advantage in tank numbers. 2nd RTR breast the rise and mince up the German tanks, supported by long range fire from the Crusaders. They are also in mg range of the German anti-tank guns and the 50mm is lost, whilst one 37mm is suppressed and the other knocked out. The infantry also make an impact, despite their small numbers, advancing forward and helping to engage the 37mm. German motorcyclists respond by moving forward to screen the German line. The 25pdr of Jaxo Column manages to suppress the 88mm during move 8. The Germans get some satisfaction with the destruction of 2 tanks from 2nd RTR, from a mixture of infantry anti-tank rifles, 20mm flak and 37mm fire. The final positions. During move 9 the rest of the German tanks finally move across to help their comrades who are under severe pressure. 6th RTR wheels across the ridge and decisively defeats them in a flurry of opportunity fire, although half their number end up suppressed (indicated by the brown lichen placed behind them). A tactical mistake here: the Germans should have halted outside half 2pdr range, but within half 50mm/75mm range, which is possible with the ranges in BKC. This they failed to do, the German commander rashly advancing too far under the influence of Hoegaarden (Belgian white beer) provided by the British commander! Although 2nd RTR are nearly wiped out, mainly by fire from the 88mm, move 10 sees the Germans lose their next to last tank and go over their breakpoint by one. They need to roll 9 to continue, but an 11 sees them abandon the field. Probably a wise decision - they have lost 7 out of 8 tanks, as well as the 50mm, one 37mm and two of the motorcycle stands. British losses were 6 tanks from 2nd RTR and 1 from 6th RTR, with no loss amongst supporting arms. These losses mean the victory counts only as minor one. A fun game, taking 3 hours to complete. Use of command re-rolls by the British CO, operating as a brigade commander (a house rule) were prominent in keeping the British moving. If the second German tank group had arrived on time and on the German left flank, it might all have been different. Although history was reversed, it was interesting that many features of the real battle manifested themselves. For example, 2nd RTR advanced, then backed off after initial casualties. There was also much skulking around behind and around rises and dead ground by both sides. The need for British tanks to close to mg range when attacking soft targets was a real problem for them. This has turned out to be a long post, but I hope you have enjoyed having something to get your teeth into! I use TSS as well - bit disappointed about the change in colour of the sand terrain stuff but as a matter of interest how much did your custom ridge tiles cost???? They were quite reasonable. £8.50 the pair. One was 2' x 1' the other 2' x 8". I picked them up at a show so postage would have added on top under normal circumstances. Love it Keith - nice one, mate. Have a look at my paltry blog if you like. I'm just getting into the hobby, potentially, and I'm curious how you base your 6mms and what ground scale you use? I'm not even sure I'm asking this correctly, but hopefully my question is clear enough. Thank you again for such great write-ups and making this game so accessible. Todd, thanks for posting. I base my 6mm infantry 3 to a base 20mm x 20mm. Most BKC gamers would probably use a bigger base (e.g. 30mm wide x 20mm deep) with five figures on at this scale, but my basing scheme means I have to paint less figures! Basing is not really an issue with BKC - just pick what looks good to you. Ground scale for BKC (using one base or vehicle = a platoon) is one centimetre represents 20metres. Some people use the alternate scale of 1 model = 1 real vehicle, 1 base = a squad/section. This is less popular but works fine, and ground scale is then 1cm:10metres.